One of the many desirable aspects of the Android operating system is the ability to customize the look of your device to however you see fit. One of the easier ways to do this is by applying what is called a “live wallpaper.” A live wallpaper is an animated image that takes the place of a stagnant image on your homescreen. 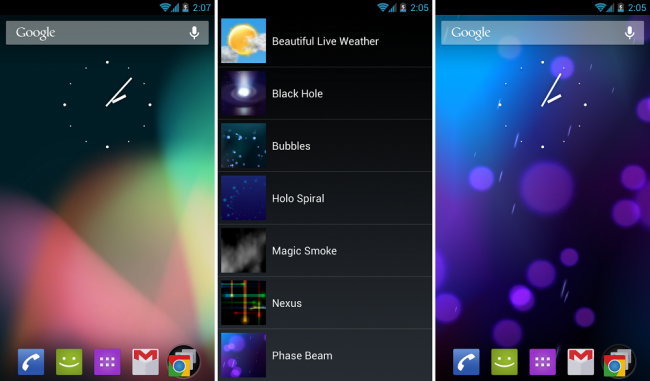 Some live wallpapers are interactive and react to certain gestures or motions on the device. They are easily set, just like a normal wallpaper, but depending on the live wallpaper, you can spend hours customizing them. Here is how you set one up. 1. On any homescreen, place a finger on the display and long press. 4. Here you will see a list of the live wallpapers that are installed on your device. 5. After selecting one, you can preview what your device will look like while the live wallpaper is applied. 1. First, head into the Settings menu of your device. *Press the Menu button and then Settings. On some devices without a Menu button, you can pull down your Notification menu and select the Settings icon. 3. Under Display, you will see an option for “Wallpaper.” Select it. 4. 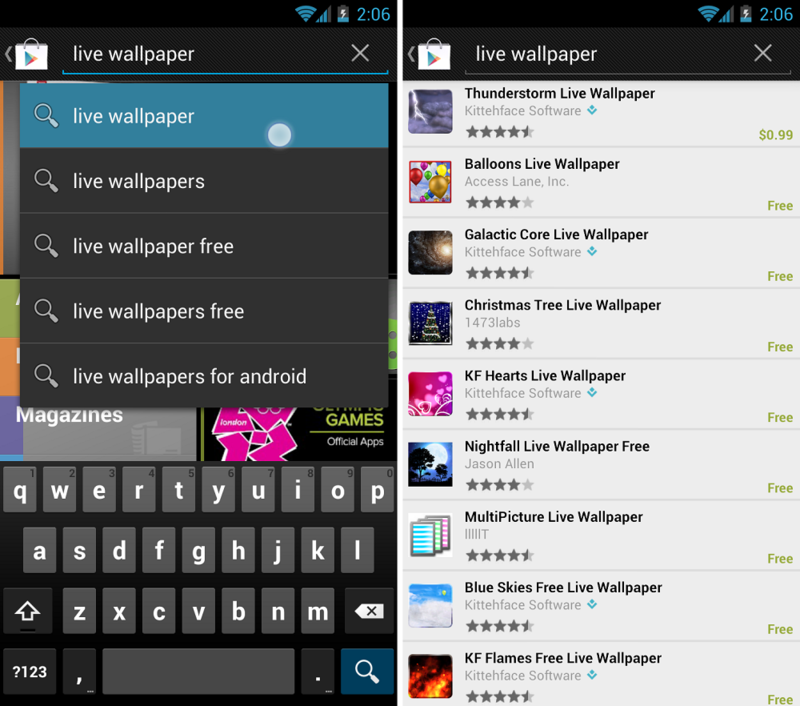 From here, select “Live Wallpapers” which will pop up the list of your installed live wallpapers. 5. From there, follow Steps 5 and 6 on the Standard Method. 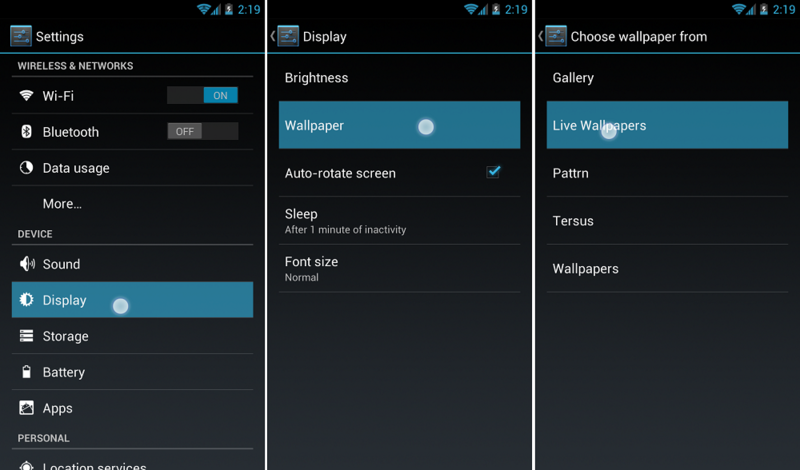 Getting more live wallpapers onto your Android device is easy. If the ones pre-installed don’t interest you, there are thousands that can be downloaded directly from the Google Play store. 2. Open the search bar that appears on top. 4. Your screen will be populated by a never ending list of free and paid for live wallpapers that you can install. 5. Once you find one you like, install it to your device. 6. Once installed, follow the directions starting from Step 1 in the Standard Method above. Having troubles finding one you like? We have plenty of great examples in our live wallpaper section.